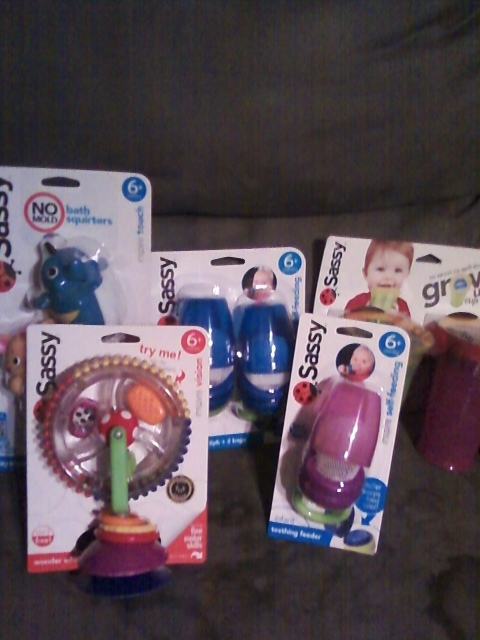 Sassy Prize Pack #Giveaway CLOSED!! I love the products from Sassy. I remember when I had my daughter, one of my friends had given me a very cute and creative looking gift basket that was filled with all Sassy products. Ever since then, I have used Sassy products for my kids. I love the toys and the feeding products. The toys range from teethers to great colorful and noisy toys that babies just love. Then their feeding products are great. I love the Teething Feeders and the other feeding products that are perfect for little eaters!! Well I was sent a really great pack of Sassy products that I will be giving to one of my amazing readers. In this great pack there is a very cute Wonder Wheel. This wheel is great to attach to a highchair tray to keep your little one entertained while you are cooking or cleaning. Little ones can spin this wheel to see cascading colors and colorful beads that really get a little ones attention. Another great product that is in the great pack are the Stay Clean Silly Squirters. Little ones love bath time and they love to splash and play in the water. What better bath toy than one that is made to prevent that nasty mold and mildew from building up so you and your little one can enjoy more bathtimes filled with silly fun!! These fun little creatures snap together, they are dishwasher safe and can be air dried as well. You can mix and match them to make fun and silly characters for a bathtime full of fun!! The Teething Feeders are great for those little teethers and are perfect for promoting a little independence when it comes to feeding time. The cap is great for chilling food for your little one or for keeping food fresh and safe when on the go. These are also dishwasher safe! I love the little mesh bag that helps keep your little one from choking while they are eating like big kids!! The wonderful people from Sassy would like to give one of my amazing readers the gift pack pictured below filled with awesome Sassy products for little ones to enjoy! Tell me what other Sassy product you like! Please leave me your email with this entry! This giveaway is open to US residents. This giveaway will end at 11:59 pm on September 12,2011. Winner will be chosen at random.org and will be given 48 hours before another winner will be chosen. All products for reviews and giveaways are given as a sample from the companies. All opinions in reviews I conduct are my own. I was not paid to say anything or review any products. I like the Sassy Seat Doorway Jumper. Another fan of the Sassy Seat Dorway Jumper!